Hammer v GM Chris Ward – pt. deux! Please remember this is strictly first come, first served, so reserve your place now! We hosted Chris this time last year, putting out 15 boards in one of the best events of the last 12 months. 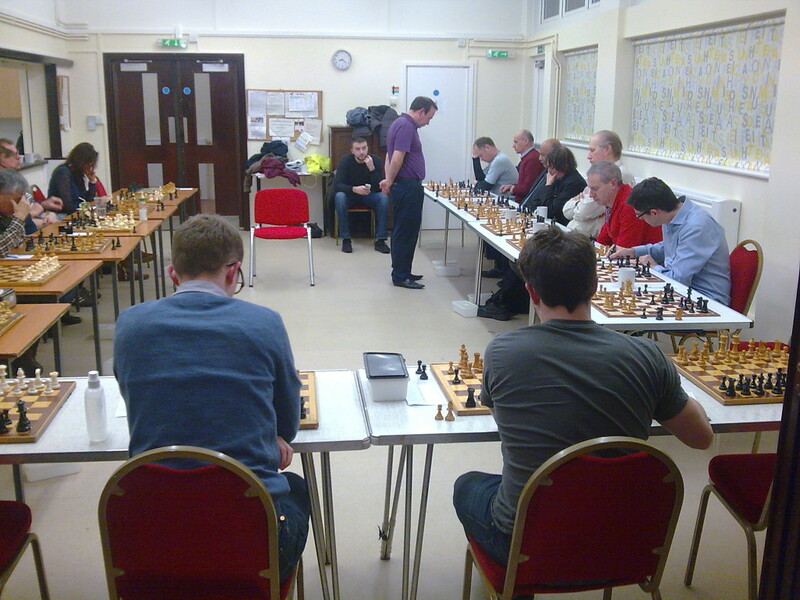 It was a fantastic evening of competitive chess, interspersed with some great stories and patter from the esteemed GM. Sadly for us, Chris won 14-1, but our sole victor Carsten did a great write-up of his victory. The rarified atmosphere of a GM Simul is something else! One of the highlights of a Simultaneous is the opportunity it presents for players of all abilities. Two of the closest-run games last time came from players rated under 125. The pressure on the GM is immense and quite a leveller. You stand to learn something no matter what the result. We’re expecting a strong response on this one, so make sure you get in touch with John White (john.white49@ntlworld.com) to confirm your spot as soon as possible. We’ll be opening up the invite to other clubs & non-members later in the month if there are any spots left! Don’t forget the return leg of our double-header against South-West London juniors at Lytton Hall this Monday 13th. As usual, it’s an early start for the youngsters with the game kicking off at 6.15pm. We’ve got 20 boards confirmed, so promises to be a hectic evening! SW London’s main man, ECF trainer Tony Niccoli will be staying with us after the game to present another evening of training and analysis. His last session was a truly valuable evening. He’s a super-strong, ultra-sharp and engaging trainer. No matter what your grade, I guarantee you will learn something from Tony! Author HammerPosted on March 9, 2017 March 9, 2017 Categories Club Updates, General ChessLeave a comment on Hammer v GM Chris Ward – pt. deux! When an animal is cornered, even one as cultured and sophisticated as Hammer 1, they will fight tooth and nail for survival. Tonight, when the chips were down and Hammer 1 were facing the prospect of relegation, the fighting nature endemic in all Hammer chess players came to the party. The mantra was: we may still be relegated…. but not on this night, not as a result of this match, and not against Kings Head 3! Hammer 1 stepped up to the plate and delivered. We took a giant step towards retention of Division 3 status in a great display of sheer will power from all involved. 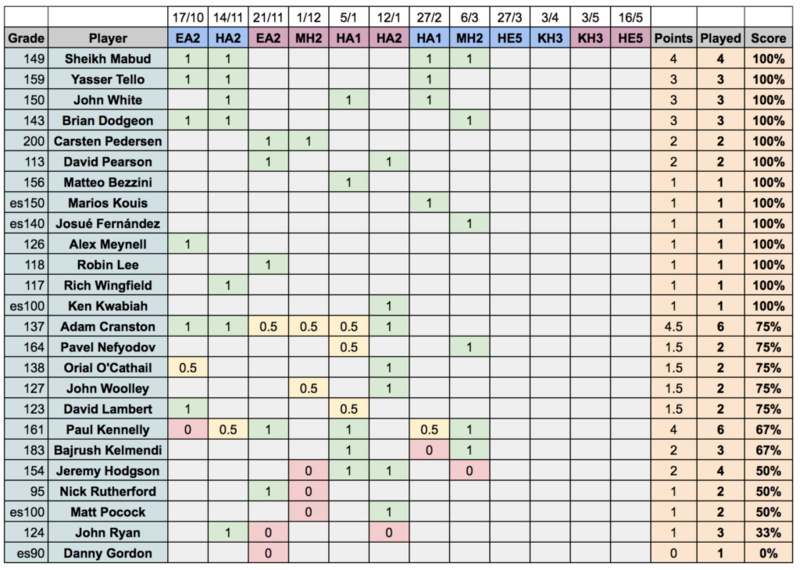 Enough of this hyperbole – let’s examine the nuts and bolts of the night in board order. On board one our Chairman the WOSF himself cruised to a comprehensive victory. Bajrush meant business – our first point on the board. Paul on second board had the nights only adjourned game. His opponent has sealed the move and the consensus is that Paul has a won game. Let us hope his opponent agrees. Board three saw Jeremy display the skills of Houdini to escape the grip of an eternal pin and agree a draw in a bitterly fought contest. Board four saw your correspondent agree a draw for my own sanity and that of Hammer 1. Despite being a pawn up, the draw was the right decision for our team and myself. Please feel free to ask me at the club as to why this was so. Sheikh was next up and played a beautiful game with the Black pieces in a Sicilian. He won the exchange and smoothly converted. Classic Sheikh. Next to our only fallen warrior of the evening – Safi. He had one of those games on one of those nights. To be honest he was far from his best and the loss was inevitable. Matteo demolished a fellow Italian on board seven, even having to explain the en passant rule to his opponent. Matteo was as cool as the suit he was wearing and scored a well-deserved victory. Josue had a dominating win and was the first to finish – just a comprehensive win. Orial, the wizard of Dingle, brought the luck of the Irish to his match. He claimed he played terribly… but he still won… and that is all that counts. Memories of Napoleon come to mind – do not give me great generals; give me lucky ones. To be honest I think Orial was too hard on himself and he was never in danger. Board ten was a walkover and Hammer 1 got its first freebie point of the year. So, in summary – we lead 7-2 with one game to be decided. Our biggest win of the season and one that should ensure survival in LL Division 3. The moral of the story is do not mess with Hammer 1 when they are facing down the barrel of a gun. These boys are tough and not to be messed with. Great job lads – I am dead proud of you all!!! 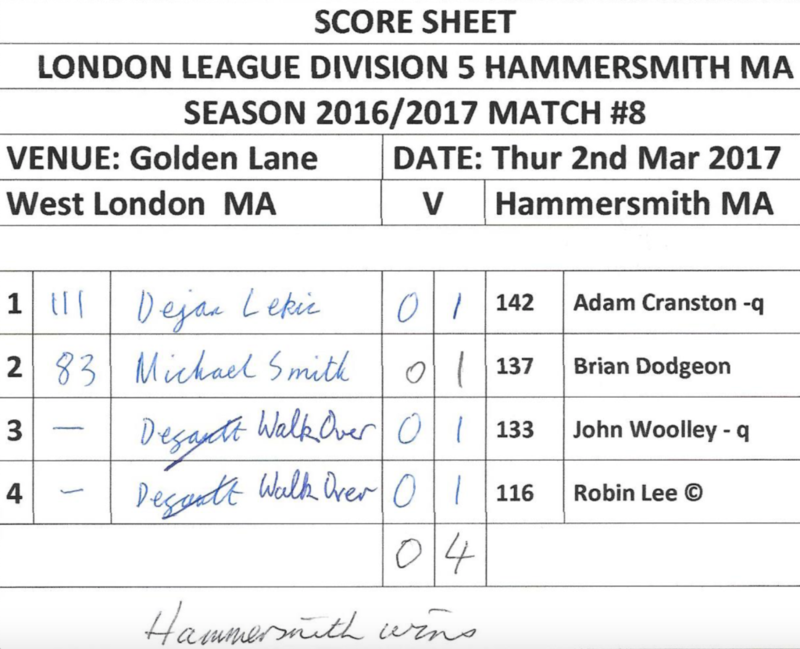 With seven wins from eight games and four to play, Hammersmith are still going strong at the top of the Middlesex League. … although it might best be described as a massacre. His ungraded opponent opted against developing his Queenside and didn’t feel the need to castle. As might be expected against as strong a positional player as Josué, this strategy did not work out well. In one of the quickest wins I’ve seen in club-level chess, the game was over on move 20 with a bizarre yet utterly dominating checkmate. Board six featured Brian “Magnus” Dodgeon, and as is often the case his opponent was not offered a single chance to get into the game. Brian started turning the screw from move one, and the evaluation just got better and better. Eventually his opponent could withstand the squeeze no longer and offered his hand in resignation. Sheikh “Snake” Mabud provided yet another fine performance on board five. 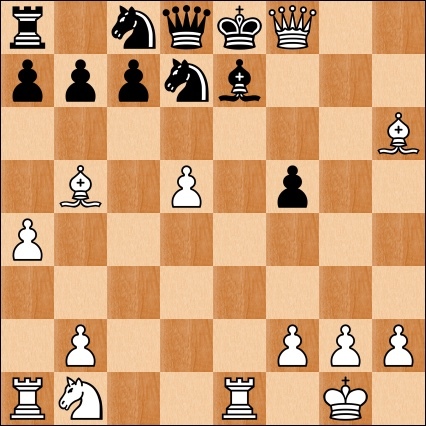 With a very strong pawn planted on e5, he started manoeuvring his pieces. His opponent followed suit, with both seemingly creating an additional pin or fork threat with every move. Sheikh handled the complications splendidly, eventually clearing the g-file for his Rooks to come flying in with checkmate. It was not to be Jeremy’s day on board four; his superior chess set and digital clock seemingly not enough to intimidate his opponent. 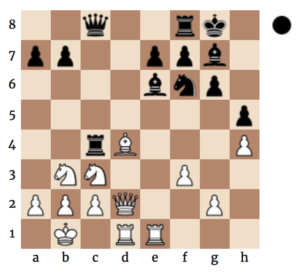 With the Black pieces Jeremy appeared to get a fine opening, planting two super-strong Bishops on d4 and e4. A slight let-up allowed his rival to bring his big guns into the game, and out of nowhere Jeremy was forced to resign. Paul sat down on board three with one thing in mind: to rain hell over the board. He didn’t disappoint. 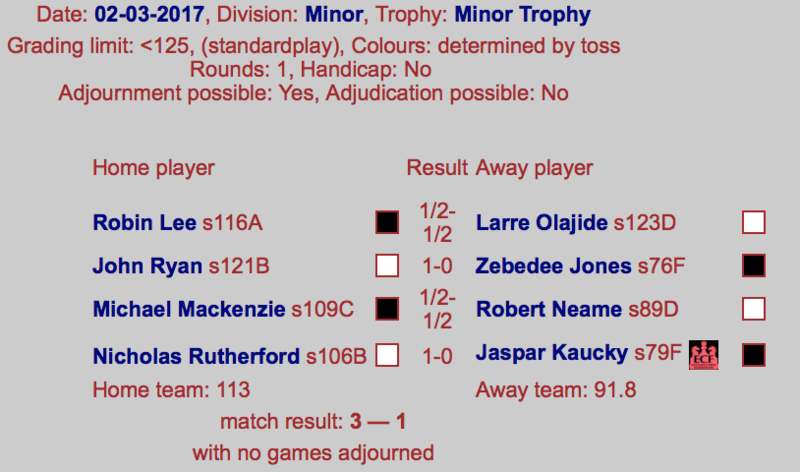 The second game to finish on the night was one of the most convincing wins of the match; hopefully Paul can keep up his fine form for the rest of the season and into the next (ed: and maybe provide us with an annotated version of the game??). And onto the top two boards, which both followed a strangely similar pattern. 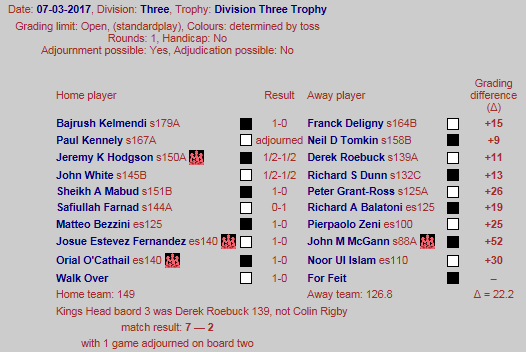 Bajrush with White and Pavel with Black both outgraded their opponents by 34 points, yet both managed to play horrific openings. Bajrush was forced to retreat his Knight to b1 on move four, and later missed a tactic that almost cost him a piece. Pavel’s opening was arguably worse, as he failed to develop any of his Queenside and was forced to defend against an advanced pawn on f5, a dangerous Bishop eyeing his Kingside and a Knight providing constant forking threats. At this point, both decided it was time to wake up! With a little help from their opponents, both turned their predicaments around, each eventually extinguishing all the enemy threats and creating unstoppable passed pawns! With four games left to play, the title is still by no means guaranteed. Harrow and Hendon could still feasibly both finish above us if we ease off too much towards the finish line. Despite this, I’d still like to give some appearances to more of the club’s burgeoning member base. Josué’s win makes him the 25th player to play for the team and the 13th now sitting on 100%! My target is for us to reach 30 players by the end of the season. 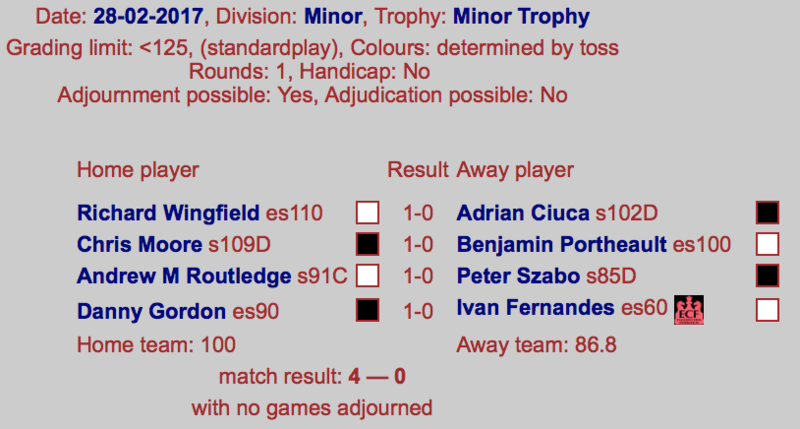 This last 7 days has been a week of sweet, sweet victories for Hammersmith Chess Club, perhaps historically so! A huge well done and thank you to all involved! Another treat for you all this evening, with a detailed analysis of an interesting game from his back catalogue from another one of our newer members, Josue. Back in 2011 he faced a much stronger opponent, graded some 20 points higher than him. It’s a brutal, hard-fought game lasting well over 50 moves with some great analysis and insight. Many thanks to Josue for sharing, and as always if you’d like to submit a game to the website please get in touch! The more the merrier!